Most people might not think New York City has much wildlife but with all the parks in and around the city, there is a surprising amount of furry and feathery creatures about. Last April I wrote about Dora who built her nest near Tompkins Square Park. 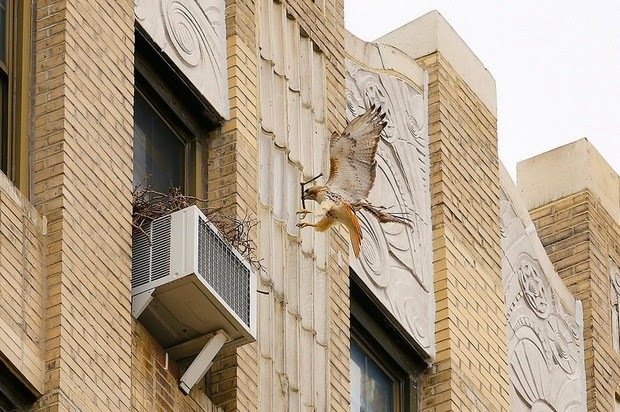 It seems that Dora, and her mate Christo, have been displaced from their home because of building development but thankfully have found a new home at Ageloff Towers on Avenue A between E.3rd and E.4 streets, where they are building a nest on a 12th-floor air conditioner. You can see a slideshow of the two here – click here.